This has a fine modern altar, placed here in 1964, in memory of the Reverend Philip Rogers. 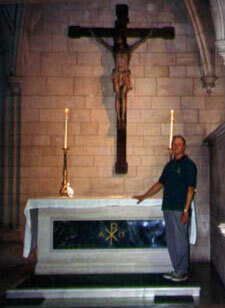 The altar was designed by John Philips and is made from Portland Stone and built by Templeman and Son. One of the stonemasons was Raymond Merrifield, who is still a chorister in St Stephen’s Choir. Sealed within the Altar are the relics of St. Justin and St Bendict of Benevento. 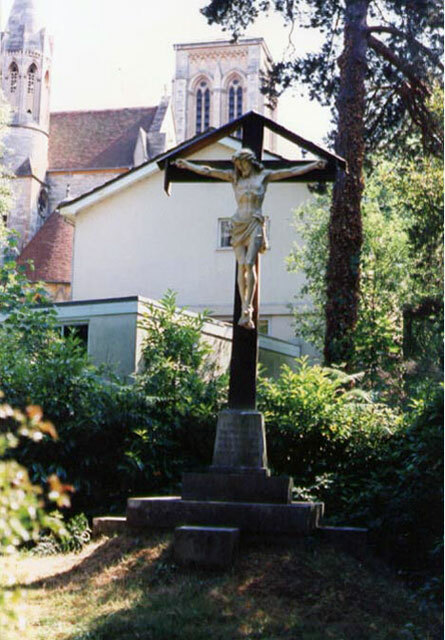 The superb large crucifix on the wall was originally outside the church, in the Calvary Garden. 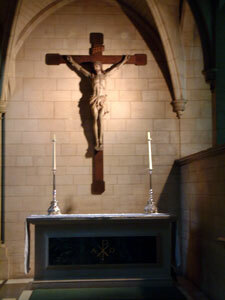 The altar candlesticks are French and the Crucifix is 16th Century. In the aumbry in the wall to the right of this chapel, the holy oils are kept, so that the sick may receive the Sacrament of Holy Unction (anointing) which is an important part of the Church’s ministry of healing. On the desk to the left is our Book of Remembrance, which records as far as possible the names of past Communicants of the Church. Each week we specially remember those who died in that week.